Werner's Cairns blog: New Zealand study debunks the fallacious spin about the benefit of fluoride. 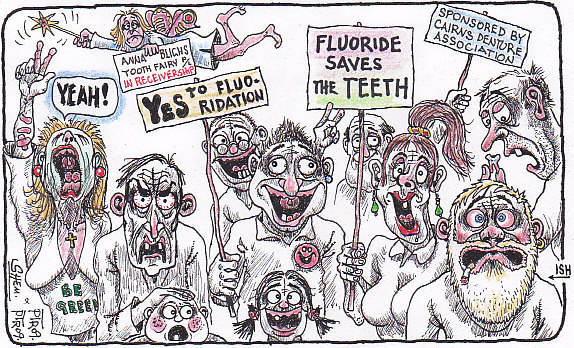 New Zealand study debunks the fallacious spin about the benefit of fluoride. 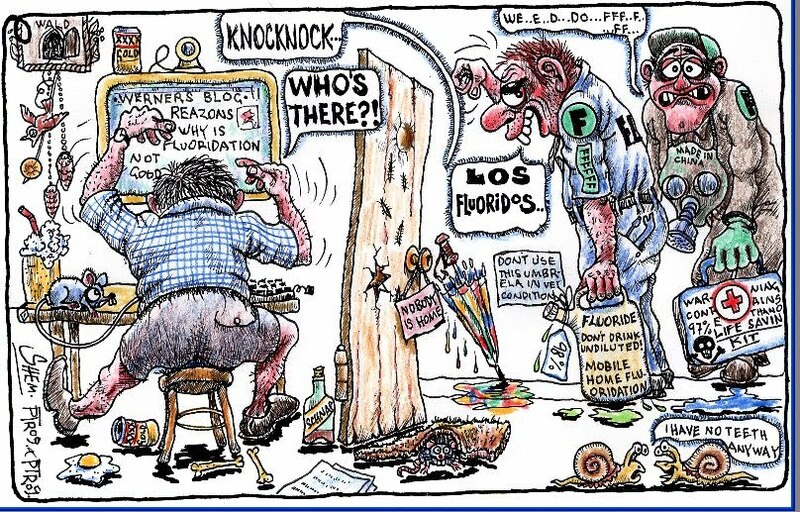 It is amazing that New Zealand authorities finally seem to be waking up to the futility of the costly and unnecessary fluoridation of their drinking water. This is exactly what many prominent scientists have been saying for years, but they were conveniently ignored by vested interests. In Europe, with the exception of England and Ireland, water fluoridation is banned. This alone should be a powerful message, but then again, none are as blind as those who don’t want to see. Click on picture to enlarge! In the USA and Canada they are also waking up about water fluoridation. Many states and provincial regions are now fighting to have the poisoning of their water stopped. Here in Queensland most of our water contains calcium fluoride (the good fluoride), but our Labor government was hell-bent that everybody must drink this poison and mandated it surreptitiously, without asking the population if they want it. This was an action of a totalitarian government and the rate payer is now lumbered with the ongoing costs. Will they ever admit that they were wrong? Not in your life! If you want to know, why John Colquhoun changed his mind about fluoridation, click here. Below is a short excerpt. I quote: I had been taught, and believed, that there was really no scientific case against fluoridation, and that only misinformed lay people and a few crackpot professionals were foolish enough to oppose it. I recall how, after I had been elected to a local government in Auckland (New Zealand's largest city, where I practiced dentistry for many years and where I eventually became the Principal Dental Officer) I had fiercely - and, I now regret, rather arrogantly - poured scorn on another Council member (a lay person who had heard and accepted the case against fluoridation) and persuaded the Mayor and majority of my fellow councillors to agree to fluoridation of our water supply. Unquote. More Fluoride FACTS, click here. N.Z. Health Ministry Finds that Fluoridation Does Not Reduce Tooth Decay. April 30th, 2010. Click on picture to enlarge! Statistics from a study conducted by the New Zealand Ministry of Health suggest that there are no advantages derived from fluoridation. These statistics actually match similar arguments set forth by the American Dental Association. The latter organization conducted a large study on some 39000 American children and found that they did not derive any advantages from the use of fluoride. The process of fluoridation is the practice of adding fluoride minerals to a water source so that people can get exposed to the mineral through drinking water. Some bodies of water already have fluoride in them and do not need fluoride added. The fluoride is allegedly added so that it can help in the prevention of cavity development. The practice of adding fluoride to water is supposed to allow many people, regardless of income, to receive healthy doses of fluoride. Yet, recent studies are revealing that the fluoridation practices do little in terms of cavity prevention, if anything at all. The study conducted in New Zealand by the Ministry of Health reveals that children living in areas with no fluoride have one percent fewer cavities than those children that reside in regions where fluoridation is offered. Nevertheless, the Health Ministry still asserts that some thirty percent of children will gain some advantages from regular fluoridation. While the assertion may seem somewhat paradoxical, the statistics offered by the organization mix low and high socioeconomic towns and cities to supply a figure to represent the nation. This mixing of statistics results in a rather poor representation of what is really going on. Some researchers argue that the statistics would reveal that both groups of tested children would benefit from fluoridation if fluoridation had advantages. In truth, the statistics are actually revealing that children are simply not benefiting from the use of fluoridation. The bottom line is that the Ministry of Health is trying to make the use of fluoridation sound more promising. Some researchers suggest that the Ministry is acting against at least fifty years of studies that indicate fluoridation does not provide an adequate defence against cavities. FLUORIDE IS NOT JUST ABOUT TEETH - IT CAN AFFECT ALL PARTS OF THE HUMAN BODY. Please pass this blog address on to your contacts. Robert Carton, PhD, former Environmental Protection Agency Scientist, 1992 - had this to say: "Fluoridation is the greatest case of scientific fraud of this century." Posted by Werner Schmidlin at 9:21 PM Labels: NZ fluoride study 2010. You are correct that people around the world are catching on that fluoridation is a scam and certainly not in the public interest. Last year in the U.S., all cities in the state of Nebraska voted on the issue. Over 90% voted to oppose fluoridation. Just like tobacco, the big money can continue only until the people wake up to being taken advantage of. Oh, for God's sake Werner; move on! China Choppers, you may be happy to swallow your toxic waste mass medication, but I for one am thankful that Werner continues to speak out against this unsafe, ineffective, outdated and unethical practice. Perhaps if you looked into the truth behind this scam you’d encourage Werner’s persistence rather than make such disparaging remarks. It is obvious that China Chopper’s brain, assuming he/she has one, has been affected by to much fluoride already. One of the symptoms of this is making silly comments, diminished capacity of using his/her brain to consider something carefully, has been brainwashed by the Queensland Labor Party, and is one of those creatures who are never capable of seeking and accepting the truth. If you enjoy drinking fluoridated water, so be it, but why should I be forced to drink it drink it when is causes me health problem? I would call you a birdbrain, but I won’t, as this would be an insult to the birds – as they are much, much smarter. China chopper, I have been moving on all my life, I don’t need your encouragement. If you mean however that I should be quiet about an insidious poison surreptitiously put into our drinking water then you are talking to the wrong person. "All that is necessary for the triumph of evil is that good men do nothing." - Edmund Burke. Well, I’m not a do "nothing person." Adding fluoride, a waste product from the aluminium and fertilizer industry into our water without asking the people was evil, with a capital E. One cup of tea contains 4mg of fluoride, so why would any reasonable government would want to spend millions to add an extra dosage to a cup of tea? More and more people are waking up and are seeking the truth about fluoride and see through the government spin. In the end, the truth will prevail. I would suggest that you keep “Chopping” but take your blinkers off. By the way, Tasmania has been fluoridated for about fifty years and has 42 fluoridation stations. According to Anglicare Tasmania, they have the worst tooth decay of the nation and the largest population with dentures. Will this tell you something, "China chopper," or are you incapable of correct and valid reasoning? jwillie6 you hit the nail on the head, I couldn't have said it any better. One would just wish that this Queensland socialist government would have the intestinal and mental fortitude to see the fluoride folly in the same light as leading scientists around the world. A fluoride free tea, and one which is also caffeine free and containing less tannin than other teas is ROOIBOS TEA grown in South Africa. I have just started drinking it and find it very flavoursome and satisfying. The only negative side effect from this tea from research so far indicates that it might compromise iron absorption. ROOIBOS TEA is commercially available, both standard and organic teas, in the major supermarkets. I stand corrected however on stating it is "fluoride" free. It does contain fluoride from the soil. There are claims and counter-claims on its health benefits, however it is an anti-oxidant and is caffeine free. I was a huge coffee drinker (up to 10 cups per day) and have found Rooibos the only caffeine-free beverage to be both flavoursome, satisfying and of importance to me, capable of reducing the cravings for caffeine. (Over the years I have tried many, many substitutes!) However if you are prone to anaemia, I would not recommend it. Incidentally rooibos tea is the tea "Precious" drinks in the series "Number One Ladies Detective Agency", the hit series set in Botswana, Africa. I understand the tea is still popular in South Africa.